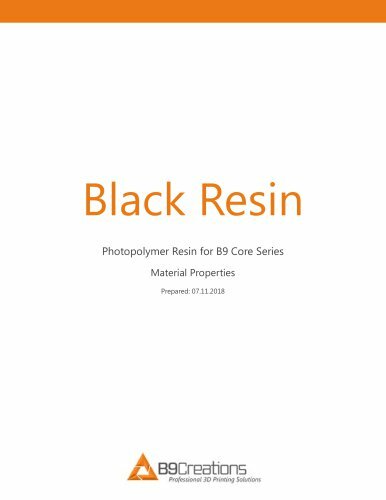 B9Creations' Black Resin is the ideal material for achieving requirements such as dimensional accuracy, strength, and temperature resistance. This material maintains its shape and dimension through curing and is capable of extreme build speeds, reaching 100+ mm per hour, without sacrificing the surface quality. Paired with the B9 Core Series, Black Resin offers incredible detail, perfect for your model's finest features. A high-strength, fast-curing resin, it's also perfect for vulcanized mold-making. "All results were from samples cured for 5 minutes.